Once the update is live it will affect active rewards like the Emissaries, so you may want to plan for when you will turn those in. A few days ago we posted that the WoW Classic Beta was added to CDC. 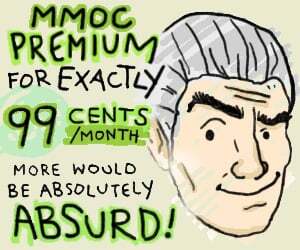 It turns out that this was associated with the beginning stages of employee Alpha testing. 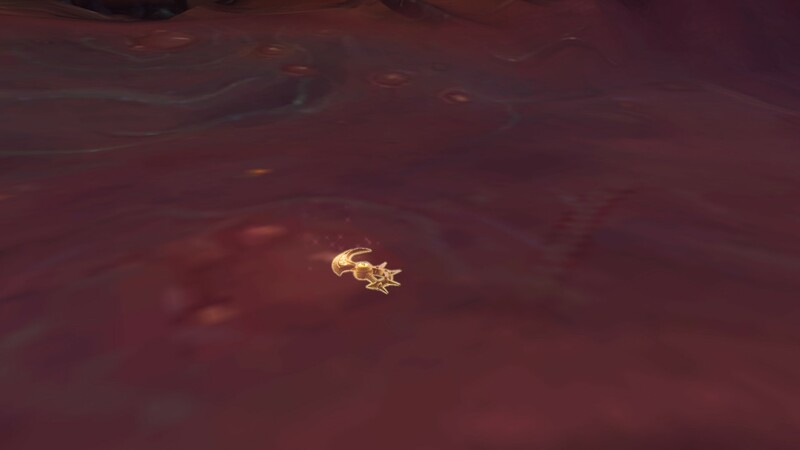 If you are Horde, the empty blade of Xal'atath will appear on the ground in Uu'nat's room after killing him. You are then given the quest The Black Blade which has you bring the blade to Sylvanas. She says that the blade will be the compass that guides the Horde to victory and that the Alliance has no idea what it's up against. She claims that with the blade, they will shift the war in the Horde's favor once again. If you are Alliance, you will only see the image of where the empty blade of Xal'atath sat, and this gives you the quest The Missing Blade to warn Anduin of what happened in the Crucible of Storms. He is concerned that the blade has fallen into the hands of Sylvanas, and says it is clear by her actions that she doesn't fight for the Horde, but death itself. He says that they must stop whatever madness she plans to use the weapon for if there is to be peace between the factions. The Phantom Pain cooldown from Mindthief's Eldritch Clasp no longer displays by default in the user interface. Anyone seen anything or read a blue post that lets us druids know if our travel forms benefit from that new slot? An entry for the World of Warcraft Classic Beta has been added to the CDN, with version 1.13.2. This brings us one step closer to beta! With the 8.2 PTR we get our first look at the achievement requirements for Battle for Azeorth Pathfinder, Part Two - which will unlock flying! In addition to completing Battle for Azeroth, Pathfinder Part 1, which can currently be completed on live servers, players will need to reach revered reputation status with two new factions: The Unshackled (H) / The Akoan (A) and the Rustbolt Resistance. 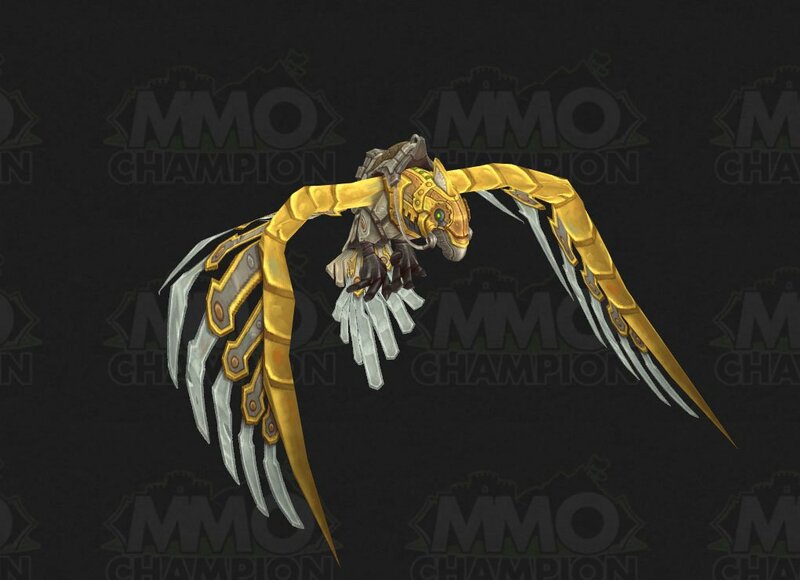 Players that unlock flying will also receive the Wonderwing 2.0 mount! 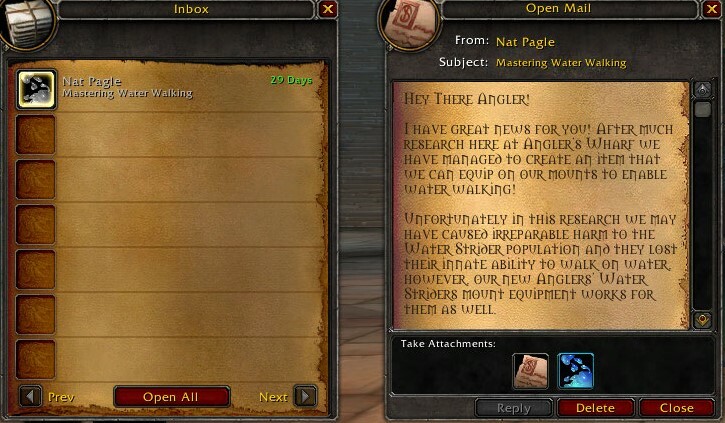 For those of you who own a water strider mount, you will receive an Anglers' Water Striders from Nat Pagle in the mail upon logging in after Patch 8.2 goes live. This new mount equipment can be slotted into your mount equipment slot to let all your mounts walk on water. Your water strider will no longer be able to walk on water without this slotted. This item is consumed when you replace it with a new piece of equipment in the mount equipment slot and needs to be purchased and slotted again to gain the effect. 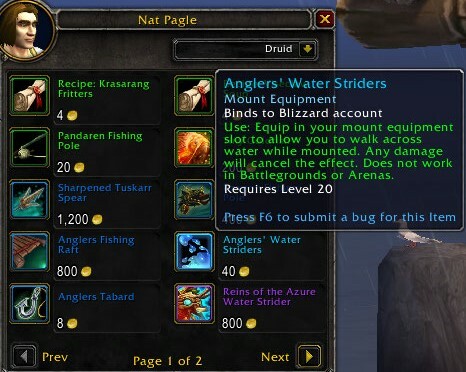 If you own a water strider, you can head to The Anglers in Krasarang Wilds and purchase a new one from Nat Pagle for 40 gold. Currently, there is no option to purchase this from Nat Pagle in your garrison.